Jeez what can I say about this? A pseudo remake of George Romero's Day of the dead, which no one asked for. Since the dawn of the dead remake which was good these remakes have gone steadily down hill. 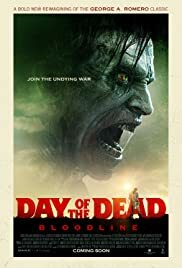 There was another day of the dead remake a few years back in 2008 with Ving Rhames and Mena Suvari that had no similarities to the original at all. Then there was Day of the Dead 2: Contagium which was meant to somehow be a sequel to the original Day of the Dead, also baring no similarities to the original. Both of these films were absolutely awful and if i haven't reviewed them already I may or not torture myself into watching them again. Anyway this remake, starts of quite promising, we see how the disease kind of starts this time (having no bearings on say dawn, or night that came before it). Except this time we have a student doctor working in virology who has a creepy patient with a higher than normal white cell rate than anyone. I seen where this was going right from that point on, he's obsessed with Zoe so much so he carves her name into his arm. When the zombies inevitably attack (possibly from a strain of influenza H1N1, that in itself a possible nod to the game H1Z1) the creeper is bitten and Zoe manages to escape. A few years later we see Zoe in an underground bunker as a main researcher/doctor of the base, just like the bunker in the original. It houses soldiers and civilians a lot more than the original film did too. Zoe is caring for an ill girl who has an illness that needs stronger antibiotics than the base has to hand for her. Zoe suggests to the irritable base leader (so much of a pale shade compared to sergeant in the original version of him) that they should go to the hospital where she worked to get the better drugs. He doesn't like this as it's out of their 'patrol zone' but agrees reluctantly to let them go so long as they're quick and efficient about it. The get to the hospital after some car trouble that really doesn't lead into anything serious other than to pad out some time. In the hospital however after getting the drugs, Zoe STUPIDLY wanders off to get some photos from an old room. She also picks up some random extra supplies and the camera focuses on some ammonia she picks up, plot point for later!! She is then attacked by the half zombified creeper. Shooting she attracts the attention of other zombies and the others suddenly realize Zoe is missing. One of the members is killed and the rest escape back to the trucks and get on the road back to the base. Unknown to them the creeper (Max) has latched onto the bottom of the trucks and gets a free ride into the base on them. Listen this film is bad, Max ends up some weird sexually frustrated pseudo Bub from the original except now his blood may and does indeed hold the cure, no not cure immunity from from the virus. So you can't cure the already dead infected people but can halt an infected live person and then make them immune to further infection. Of course things goes wrong Max escapes zombies get in, many people die, some stupid situations where if people had said something, reacted better, earlier arguments and accidents may of prevented completely. THN doesn't totally hate this as theres some good acting on some people parts especially Max and Zoe play their parts believably. So we won't totally spoil the ending and if you are bored and want to watch a brainless zombie flick and haven't seen the original so it won't feel like someone just set fire to an original copy of it in front of you it might be worth watching. THN Awards Day of the Dead: Bloodline 2 out of 5 stars.